We have such a love hate relationship with a baked egg- how they seem to fail on us after the effort we have indulged into them, coming out dry and crisp, the consistency seems lacklustre after we have lovingly made some inspired spiced cream with blitzed spinach or a trendy green shashuka to accompany the egg, the burnt edges around the oven proof dish you have used which needs soaking for a day and the most frustrating thing or all is when the egg itself disappoints! There is nothing quite as repellent as an overcooked egg yolk- powdery and orange, but weirdly bouncy at the same time, you could almost imagine bouncing it like a ping pong ball across a table. 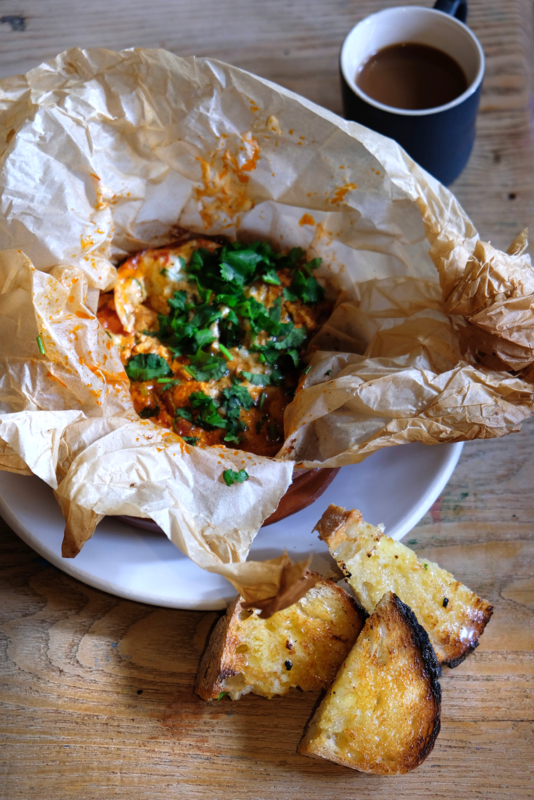 But when that baked egg is cooked to perfection and everything is singing harmoniously together, there is nothing quite as rewarding- we love, love, love coming up with new baked eggs- getting inspired by ingredients from around the world. That unexpected surprise of flavour, the different spices and the different fresh toppings to be added when out for a contrast in textures and flavours. This recipe was created in a brainstorming morning we both had over cups of tea and nibbling on the lemon cake made a few columns before in Somerset, writing down ideas for breakfasts and brunches for our new restaurant opening later this year. We have, bravely, agreed on there always being a baked egg of some sort on the menu- one that changes with the seasons and what we are fancying. We started writing down our favourites, and new ideas we want to try out- when we got to thinking of how to take it further. Both loving the personal surprise, like a fun little individual present, something cooked in a bag straight from the oven gives us- steaming hot seafood spaghetti, or a fragrant Asian fish- opened up in its parcel, flavours all married perfectly together and cooked to perfection. This is a typical us inspired dish when it comes to the flavours- we love that spiced smoky taste of chipotle, most supermarkets have little jars of chipotle paste (its one of our favourite cupboard goods), we have also used sobrassada- if you can’t find then use a little chorizo instead. On our first attempt, it was a winner- the sauce was saucy and delicious and the egg cooked to perfection, no worries of burnt hard to get out edges- once finished the paper goes into the bin with no mess. Success! 1. Preheat the oven to 180. 2. All in one pan heat a good glug of olive oil and first start crisping up the pancetta for a few minutes over a medium heat and then add the spring onions, garlic, chilli, chipotle, sobrassada, coriander stems, tomatoes, cumin and paprika- keep stirring for a good 5 minutes until the tomatoes have broken down. 3. 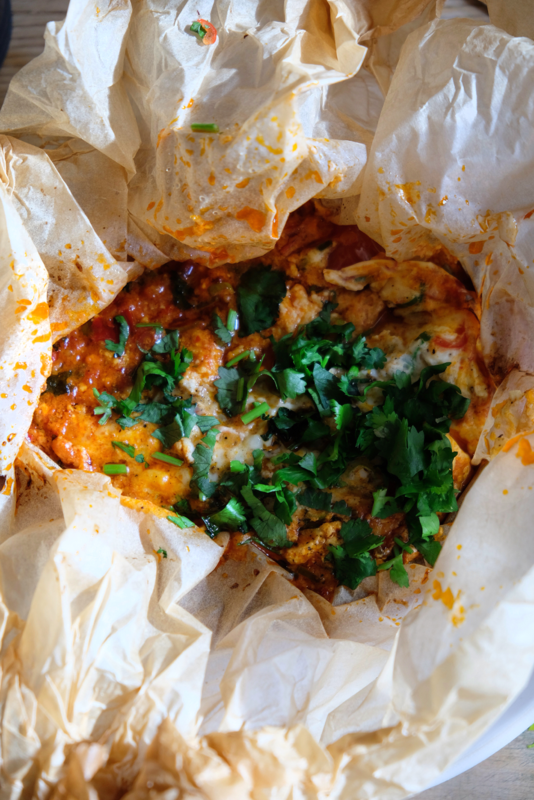 In a cereal sized bowl dip a big sheet of grease proof paper (around 15x15cm) into it and spoon the spiced tomato mixture into the centre, create a dip in the middle and crack the egg in followed by the crumbled feta. Close the edges together and tie a string around the top so its completely closed. 4. Place on a baking try and bake for 10 minutes. Take out and serve immediately with the chopped coriander leaves on top.